The ritual in playa Baru is very simple: You wake up seaside, in a wooden bed with a cheap mattress, you crawl out of bed, walk towards the water, plunge, take a swim while waking up and just remain still in the water until you start making sense of where you are. Soon at it's given time the vendors will be passing by with local bites to get your day going. After a little swim, the coffee woman comes by; she pours small short paper cups of very hot watery coffee and if that doesn’t wake you up, the sugar in it will. 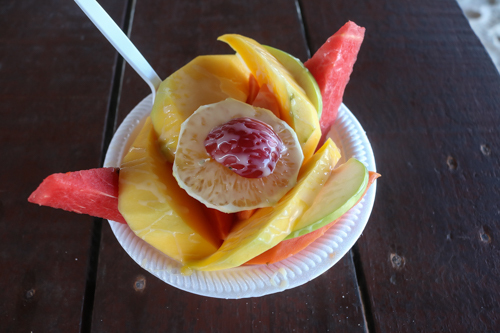 After your morning coffee nothing will happen for a bit, until you see the fruit kid coming, carrying a large plastic tray with about a dozen fruit salads in shallow paper bowls; watermelon, mango papaya drizzled with condensed milk. 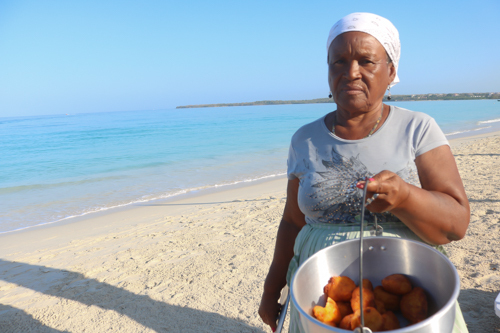 Then the woman with the pasteles shows up; warm plantain and cornmeal fritters you eat with a slice of queso fresco. Then the woman, that will hit the spot arrives: Arepas con huevo, classic Colombian arepas filled with a whole fried egg - yolk intact - and some cheese, my lord! At that point after your morning fixes you reach a plateau in which you are still swimming in and out of the water. Maybe mid morning you hit your first shot of Guaro and then just a bit later is the time for your first beer. Helada porfa ! 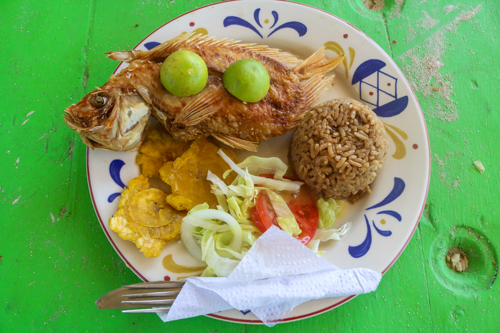 After a couple of beers, beach, water, lovely ladies walking by it’s time to order lunch; I go to one of my neighbor posadas and ask them what’s the catch of the day or just simply order blindly - make me Pescado frito o a la parrilla. You order probably ninety minutes before you want it; it gives you time for one or two more beers and more ocean and in this part of the world things take time. 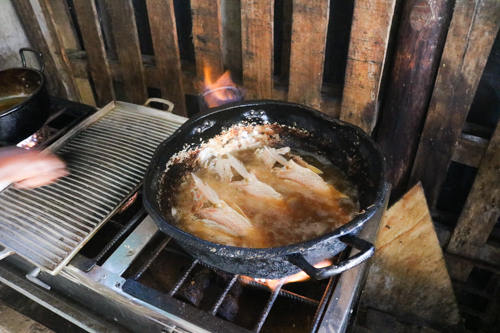 Then lunch, arroz con coco, plantains, simple iceberg and tomato salad and the fried or grilled fish. After lunch, las negras giving massages; lots of women walk by offering massages or to braid your hair, so the motion is simple, you literally fall off your lunch chair to a beach chair where our local masseuse works her magic. The massage blends into a nap and one and a half hour later when you wake up from you do the cycle all over again: swim in the water, play guitar, sunset, beers, guaro; then its time for a quick shower and head off to one of the neighbor places at night to have dinner; pizza, fish, burgers; whatever its to offer. The best is the amazingly-starred nights, ocean breeze and if you are up for it plenty of cocktails. Playa Baru is a couple of hours away from Cartagena and Cartagena a couple of hours away from Miami; so it is such an efficient decompressing escape I am glad I followed my friend Adriana’s advice. Soon certainly I come back to Baru; like a song I wrote: " .. de Baru de Baru de Baru no me quiero ir .. "